In our 24/7 world, the consumer never sleeps, and nor should your marketing. In this blog, we explore what real-time marketing is and why businesses need to take advantage. Real-time marketing (RTM) is the ability for brands to engage with consumers based on real-time information, such as their behaviour and actions on a website, changes to their data, or even external events and breaking news. Flexibility and reactivity are the main benefits, allowing businesses to break the shackles and truly respond to consumer needs and wants. Each brand may have a different set of goals and objectives that they hope to achieve through their real-time marketing activities. A Wayin study of 200 marketing professionals currently engaged in RTM activities focused on the reasons why brands invest in RTM, revealing that forming customer relationships, promoting events, and complementing existing content are the three most prominent reasons. Real-Time Marketing is not just about directly generating revenue, but building a bridge with the consumer through appealing to what matters to them right now. 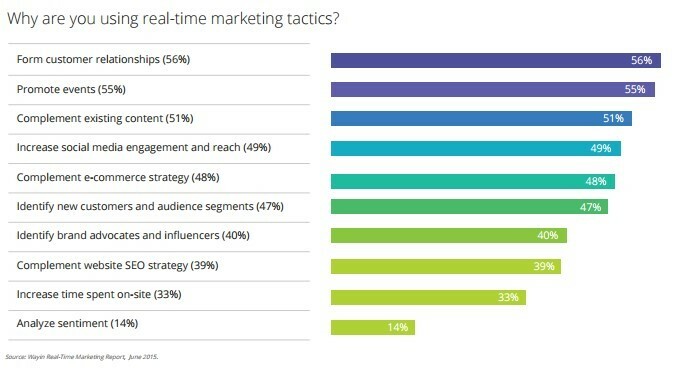 For that reason, it’s no surprise that the Wayin study also revealed that 59% of the surveyed marketers plan to increase their budgets for real-time marketing activities in the next year, with 66% indicating that they plan to increase the social media budget, with it being the prioritised marketing channel for their real-time activities. There are numerous obstacles brands face when undertaking real-time marketing activities. With customers more open to providing personal information online, the pressure is on for brands to provide a more personalised experience. A study by Janrain discovered that customers have a tendency to lose interest when presented with content that isn’t relevant to them, so delivering the right message, to the right person, at the right time is integral. Wayin’s study also looked at challenges when implementing real-time marketing via social media, with the majority of marketers citing limited budget and lack of flexibility by staff to react quickly enough as the top two challenges they face. Gathering this information in a cost and time efficient manner and acting on it with confidence is clearly a key problem for marketers dealing in the RTM arena. One company that effectively used its data to provide real-time marketing is Google, who performed a RTM promotion during the 2015 Oscars. The objective of the campaign was to promote the brand’s Google Play platform by providing links to users who could then purchase the winning movie’s moments after the winner had been announced. Google had launched a similar campaign previously with Nike for the 2014 World Cup, however this was the first time the search engine giant used data to promote its own product. The campaign was based on past search trends with data showing users would look up stars or movies during previous awards shows, with interest in the winners only lasting about 15 minutes. After each major award was announced, Google Play served a customised congratulatory ad, and within 15 minutes it was on to the next real-time ad for the next winner. Real-time marketing via social media can vary, from answering customer queries to promoting the brand via an external event, such as the Royal Baby or the 2013 Super Bowl blackout. These are two examples of external events that require two different approaches to real-time marketing. The birth of the Royal Baby is an event that can be planned for well ahead of time, but can be published on the actual day of the birth, giving the impression of real-time marketing. The infamous 2013 third quarter Super Bowl blackout gained more awareness for the Oreo brand than the television advert the brand paid a substantial amount of money to run during the game. By jumping onto a spontaneous external event with a clever promotion that was still in-keeping with the brand tone of voice, Oreo gained a vast amount of publicity and helped own a moment they had to real right to simply through their rapid response. With focus being placed on building customer relationships and understanding the forever evolving customer expectations, it’s becoming more and more important for brands to recognise that real-time marketing is becoming a more valuable marketing channel that cannot afford to be ignored. Now is a perfect time to take advantage of real-time marketing in order to spark and engage in conversations, which will lead to relationship building and deeper brand loyalty.